The 827E Fitness Cycle has a new softer design, a completely housed flywheel, and strengthened frame. A new electronic instrument shows heart rate using telemetry. 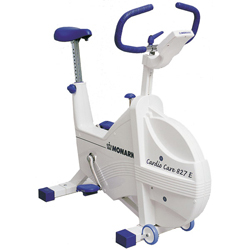 Like all Monark models, Monark 827 E is constructed to the highest quality standards and has a long life. Specially designed for intensive use in institutions and gymnasiums. Easy to use and tough, and therefore one of the most popular exercise bicycles. Electronic meter that shows pedal turns per minute (RPM), heart rate in beats per minute (HR), cycling time in minutes and seconds (TIME), intended cycling speed in km/miles per hour (SPEED) plus distance covered in km/miles (DISTANCE).